Senators appear to be a little loopy thanks to the number and the pacing of confirmation hearings for President-elect Donald Trump’s Cabinet nominees. From offering each other valium to discussing fun on couches, the hearings have had moments of levity. 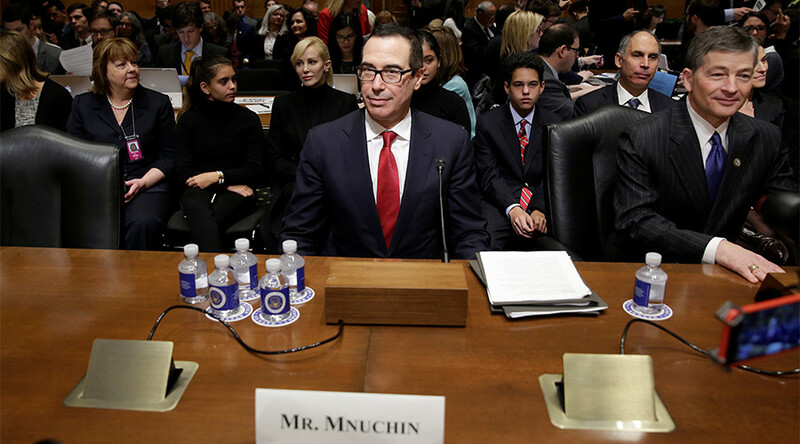 Roberts then proceeded to begin his questioning of Mnuchin, before he was interrupted by Sen. Sherrod Brown (D-Ohio). At that point, the committee ‒ and social media ‒ lost control. It wasn’t the only time the normally mind-numbing hearing captured Twitter’s attention. "Octomom" began trending after Mnuchin said he found Nadya Suleman’s situation one of the “most troubling” he’d dealt with. OneWest foreclosed on Suleman, the mother of octuplets, in 2009. The Cayman Islands also made an appearance, thanks to a revised vetting questionnaire that Mnuchin submitted on Thursday. “Governor, thank you so much for coming into my office. Did you enjoy meeting me?” Franken asked. “Please. Please. Please. Oh my Lord. Oh my Lord,” Franken replied. “Well I think we’ve found our ‘Saturday Night Live’ soundbite,” Perry said, laughing. Earlier in the week, the Senate Health, Education, Labor and Pensions (HELP) Committee’s confirmation hearing for Betsy DeVos to be education secretary became meme-worthy when Sen. Chris Murphy (D-Connecticut) asked if she believes guns have “any place in and around schools.” DeVos referred to a story shared by Sen. Mike Enzi (R-Wyoming) about a school in his home state. “I think probably there, I would imagine there is probably a gun in a school to protect from potential grizzlies," she said.